My latest Viewpoint, “Corporate funding of food and nutrition research: science or marketing,” was published yesterday in JAMA Internal Medicine 2016;176 (1):13-14. doi:10.1001/jamainternmed.2015.6667. The longstanding influence of food industry funding on nutrition research, researchers, and professional societies1 threatens the credibility of nutrition science. So much research is sponsored by industry that health professionals and the public may lose confidence in basic dietary advice. Although most journals now require authors to disclose who pays for their work, disclosure—even done diligently—is not sufficient to alert readers to the extent to which industry funding influences research results and professional opinion. As is well established from experimental and observational research, drug company gifts and grants can have substantial effects. To recipients, however, these effects are almost always unconscious, unintentional, and unrecognized, making them especially difficult to prevent. Medical schools and medical journals have increased efforts to minimize and manage conflicts of interest with industry. But from my observations, nutrition researchers, journals, and professional societies, like medical researchers, often fail to realize that food-industry funding may affect their work and its credibility. Two recent investigative articles in the New York Times illustrate the concerns about biases introduced by industry funding. The first3 described the support by Coca-Cola of academic researchers who founded a new organization, the Global Energy Balance Network, to promote physical activity as a more effective method than calorie control (eg, from avoiding sugary sodas) for preventing obesity. The second4 analyzed emails obtained through open-records requests to document how Monsanto, the multinational agricultural biotechnology corporation, on the one hand, and the organic food industry, on the other, recruited professors to lobby, write, and testify to Congress on their behalf. Between March and October 2015, I identified 76 industry-funded studies. Of these, 70 reported results favorable to the sponsor’s interest. Despite ongoing requests to readers of my blog to help me identify funded studies reporting results contrary to a funder’s interest, I have found only 6. [Note: Since writing this, the score has gone to 90:9.] This discrepancy is consistent with the results of systematic investigations of industry sponsorship, such as one on the role of sugar-sweetened beverages in obesity.8 In general, independently funded studies find correlations between sugary drinks and poor health, whereas those supported by the soda industry do not.9 In the studies I collected, companies or trade associations promoting soft drinks, dairy foods, eggs, breakfast cereals, pork, beef, soy products, dietary supplements, juices, cranberries, nuts, and chocolates supported the study itself, the investigators, or both. These studies all found significant health benefits or lack of harm from consuming the foods investigated, results that can be useful for deflecting criticism of a company or promoting its products. Mars Inc, for example, the maker of chocolate candies such as M&Ms, funds studies on the effects of cocoa flavanols on arterial function and blood pressure. One such study, published in September 2015,10(p1246)concluded that these compounds “improved accredited cardiovascular surrogates of cardiovascular risk, demonstrating that dietary flavanols have the potential to maintain cardiovascular health even in low-risk subjects.” The study investigators,10 one of whom is employed by Mars, followed well-established scientific protocols in conducting the research. Science is not the issue here. Marketing is the issue. The question is why Mars would fund a study like this and assign one of its employees to help design and write it. In this instance, the answer is obvious. Mars issued a press release “Cocoa flavanols lower blood pressure and increase blood vessel function in healthy people,” and noted these results in a full-page advertisement in the New York Times on September 27, 2015, Neither the press release nor advertisement explained that cocoa flavanols are largely destroyed during all but the most careful processing of chocolate, nor did they mention chocolate at all. They didn’t have to. Uncritical readers are likely to interpret the statements as evidence that chocolate is good for them and that its sugar and calories can be ignored. The second New York Times article4 raised more insidious concerns about industry involvement with scientists, using Monsanto and organic food companies as cases in point. Although both industries recruit scientists to speak on their behalf, Monsanto has far greater resources. In 1994, I was a member of the Food Advisory Committee to the US Food and Drug Administration (FDA) when that agency approved genetically modified (GM) foods. I observed how Monsanto-funded scientists convinced the FDA that labeling GM foods would be misleading. Confronted with increasing public support for labeling foods that are produced with GM ingredients, the biotechnology industry supported—and the House of Representatives passed—H.R. 1599 in July 2015. This bill, expected to be considered by the Senate before the end of 2015, has the Orwellian title, “The Safe and Accurate Food Labeling Act,” but some critics call it the “Denying Americans the Right to Know (DARK) Act.” Proposed by Representative Mike Pompeo (Kansas) on the basis that GM foods are safe and, therefore, acceptable, the act would block states from enacting labeling laws (as Vermont has already done) and permit GM foods to be labeled as “natural.” Opponents question the safety of GM foods. But they also raise additional reasons for full transparency in labeling—patents, control of seed stocks, the widespread application of chemical herbicides to GM crops, and the increasingly widespread resistance of weeds to those herbicides. When evaluating conflicting scientific and policy arguments about GM foods, it is useful to know who funds the researchers and their studies. Should nutrition researchers and professional societies accept funding from food companies? Not without careful thinking. It’s time that food and nutrition researchers and societies recognize the influence of food-industry sponsorship, take steps to control its effects, and ensure that sponsored studies promote public health, not the marketing of food products. Journal editors should ensure that editors and members of editorial boards are free of industry conflicts, require peer reviewers to note food-industry funding in manuscript evaluations, and be wary of accepting industry-funded publications with evident commercial implications. If food companies and trade associations want to fund research, they should consider pooling resources and setting up an independent foundation to administer the grants. Everyone involved in this system should be doing everything possible to advocate for more research funds from federal granting agencies. Nothing less than the credibility of nutrition research and advice is at stake. 1 Nestle M. Food Politics: How the Food Industry Influences Nutrition and Health.3rd ed. Berkeley: University of California Press; 2013. 2 Lo B, Field MJ, eds. Conflict of Interest in Medical Research, Education, and Practice. Washington, DC: National Academies Press; 2009. 3 O’Connor A. Coca-Cola funds scientists who shift blame for obesity away from bad diets. New York Times. August 9, 2015. http://well.blogs.nytimes.com/2015/08/09/coca-cola-funds-scientists-who-shift-blame-for-obesity-away-from-bad-diets/?_r=0. Accessed October 22, 2015. 4 Lipton E. Food industry enlisted academics in G.M.O. lobbying war, emails show. New York Times. September 5, 2015. http://www.nytimes.com/2015/09/06/us/food-industry-enlisted-academics-in-gmo-lobbying-war-emails-show.html. Accessed October 22, 2015. 5 Simon M. Nutrition scientists on the take from Big Food: has the American Society for Nutrition lost all credibility? June 2015. http://www.eatdrinkpolitics.com/wp-content/uploads/ASNReportFinal.pdf. Accessed October 22, 2015. 6 Toole AA, Kuchler F. Improving health through nutrition research: an overview of the U.S. nutrition research system. Econ Res Rep No. 182. January 2015.http://www.ers.usda.gov/media/1760111/err-182.pdf. Accessed October 27, 2015. 7 Nestle M. Food Politics blog. https://foodpolitics.com. Accessed October 27, 2015. Corresponding Author: Marion Nestle, PhD, MPH, Department of Nutrition, Food Studies, and Public Health, New York University, 411 Lafayette, Fifth Floor, New York, NY 10003-7035 (marion.nestle@nyu.edu). Published Online: November 23, 2015. doi:10.1001/jamainternmed.2015.6667. 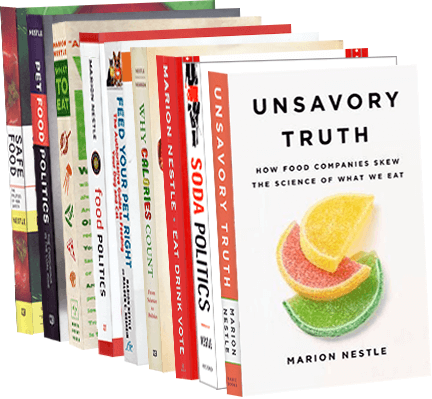 Conflict of Interest Disclosures: Dr Nestle’s salary from New York University supports her research, manuscript preparation, website, and blog at https://foodpolitics.com. She also earns royalties from books and honoraria from lectures to university and health professional groups about matters relevant to this Viewpoint.